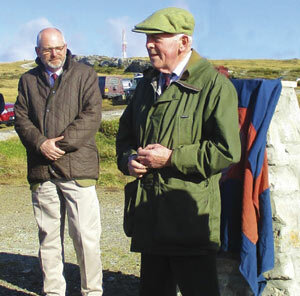 In April this year I was accompanied to the Falklands by Lieutenant Colonel Julian Sayers and Major Charlie Carty, both of whom were in the Battalion during the conflict. 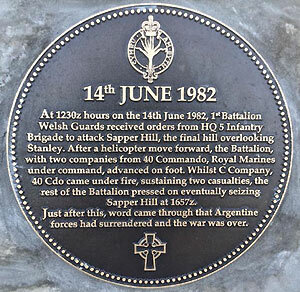 We had returned to unveil a Memorial to commemorate the capture of Sapper Hill by the Battalion on 14th June 1982. We had invited a number of Falkland Islander friends, who have shown nothing but enormous kindness to our returning veterans over many years, together with some members of our Armed Forces, currently serving in the Falklands. The tragic bombing of the Galahad has stuck rightly in people’s minds but very little has been shown to mark the part played by the Battalion after this terrible event; during my first visit to the Islands last year since the Falklands War I realised that this must be put right, hence the construction of this Memorial. Reinforced by A and C Companies of 40 Commando to replace our losses, the Battalion came under command of 3 Commando Brigade for the attack on Mount Harriet, Two Sisters, and the Mount Longdon Line, where we played a small part. After the success of these attacks, there was a delay of some 48 hours while 2nd Battalion Scots Guards and the 1/7th Gurkha Rifles prepared for their attacks on the next line of mountains, Mount Tumbledown and Mount William. As soon as these two features had been captured we were tasked to capture Sapper Hill, the nearest hill to Stanley, as by this time we had reverted back under command of 5 Infantry Brigade. We were subjected to some severe Argentine shelling during this period and Lance Corporal 03 Thomas was killed while resupplying new radio batteries to the Battalion. Our night move forward, in order to get ourselves into a good position for the start of our attack, proved a complete nightmare when we encountered an unmarked minefield. Two of our Marines lost limbs and had to be evacuated by helicopter in very difficult circumstances. At first light we had no choice but to withdraw into dead ground until the battles for Tumbledown and Mount William had been completed, as we were in full view of the Argentine positions on Sapper Hill. Soon after the successful battle for Tumbledown and the subsequent occupation of Mount William, the Battalion was lifted forward by helicopter to our Start Line in the lee of Mount William for our attack on Sapper Hill. One of the troops of C Company 40 Commando, our leading company, had been landed in error very near Sapper Hill itself and a firefight started immediately. It was therefore essential to link up with them as quickly as possible. The Battalion Command Group, together with a Scimitar of The Blues and Royals and the remainder of C Company, very quickly moved forward to do this. Luckily this lone troop only had two men wounded and, leaving them in the hands of the medics, the Battalion carried on without stopping. We attacked Sapper Hill from the rear, i.e. the area of the hill facing Stanley, only to find that the Argentines had withdrawn in great haste, leaving several dead and a plethora of ammunition and other stores behind them. Soon after this we received word that the Argentines had surrendered. I remember looking at Stanley, which seemed then such a small place and saying ‘have we really come all this way just for this?’. These words were repeated by John Witherow, The Times journalist, who was attached to the Battalion, in his book The Winter War. 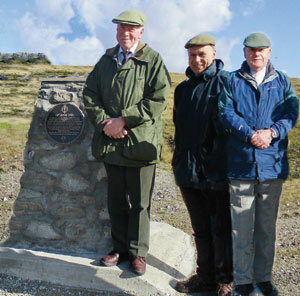 The Memorial, which the Governor kindly unveiled for us, now stands at the bottom of Sapper Hill.